oh so the number in-front actually is for the temperature? hmmmm... noob in old i hope u dont mind me asking. Aiyo.. go google "bobtheoilguy". His explanation is the easiest to understand. It's not quite temperature. It's the viscosity index when cold. The other number after "w" is the viscosity index at 100 degrees Celsius (usually means warmed up engine temp, not quite but close). There's a lot to learn about engine oils. Do your research and buy based on your budget. I've got 4 cans of 300V on the way to service my Evo and a bottle of Penrite 10Tenths for flush with Liquimoly flushing fluid. Only because I've neglected to service the car for a bit due to being onsite and my housemates driving it around for a bit. Also doing the 1500km break in service for my BMW. But this time with strong fluid that resists crankcase dilution because the N54 and N55 are very famous engines for utterly destroying even the toughest engine oils due to the ultra high pressure direct injection it uses. This might be a tough one to figure out. what are you planning for the BMW? 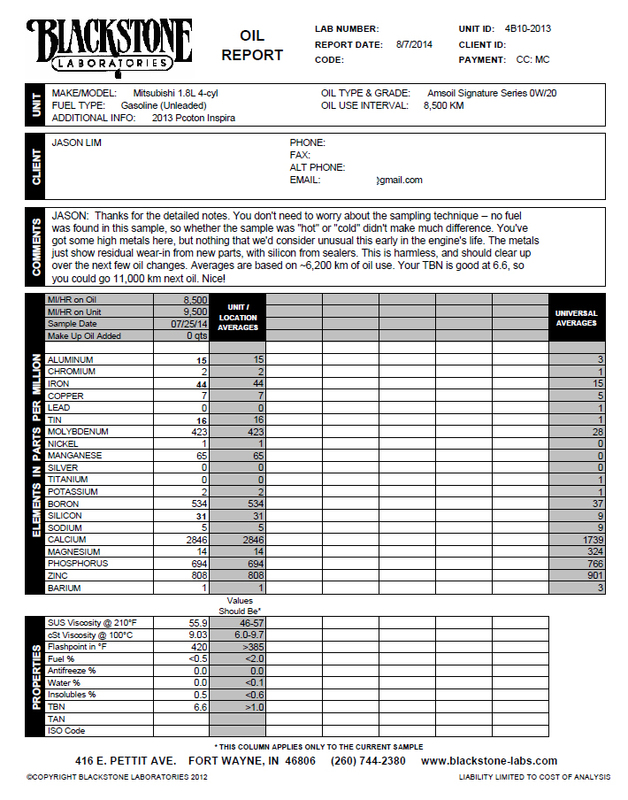 considering "1500km break in service", new car? the dealer don't restrict outside EO? BMW M cars come with requirement for a 1500/1600km oil and filter change. They call it the "break in" service. BMW does recommend Castrol, but I can use any oil I want them to put in as long as it meets requirements. But the challenges of a direct injection engine are unique due to fuel dilution causing viscosity loss. There are a lot of recommendations for Renewable Lube's BioSyn made for the Audi RS4 engine (another DI engine), but I rather not ship 20 litres of lube on freight. Also reading the N55HP's technical documentation also shows that under low loading, the Bosch ECU allows the engine oil temp to rise to about 130 Celsius in order to thin itself and lower parasitic drag, plus it also engages lean burn which also increases the cylinder temperature. It saves fuel, but remember that for every 5 to 10 celsius, your oil oxidization increases by 100 percent. I'm not sure what to consider that is locally available. Might have to switch to Shell V-Power which has lubricity modifiers in the time being while thinking about it. ah that's quite similar to almost every car brands in Malaysia although ours on 1k km instead. btw if you're looking for lubricity modifiers, have you tried out Torco's RCL? that could be just what you're looking for, at probably much cheaper price comparing to v power daily. The 4B11 is generally a bit hot, you'll generally see a rise in temps after you slow down after a long run. I don't believe the engine runs lean as the 4B11s are notorious for running overly rich to keep the cylinders cool. That's why you tend to get a lot of extra performance if you try and tune them with the "advance and lean till knock" method. I don't recall an oil pressure and temp sensor on the 4B11, so you might have to drill and tap your own. Anyways regarding the comments about fuel, because they encourage the oil sample to be taken hot (eg: driving the car for 10-20minutes/up to temperature) to avoid fuel dilutions that may affect the test results. If that cannot be done and a cold sample have to be taken (eg: oil change at proton SC that lets you sit from morning 8am to 12pm ) then it should be mentioned to BSL so that they may take note of the potentially higher fuel % found in the oil sample instead of pointing it out as an issue. As for the metal parts, sure, it's nothing unusual as per the report comments, however i did spent quite a lot on additives (namely LM Ceratec and nanoextreme ws2) expecting that wear would be on the absolute minimum considering the claims of respective additives. Granted yes, sub 10k km is still a very early stage of an engine's life and there are still some breaking in of components, however looking at the universal average on metal wear it's just disappointing. Hell, look at the calcium value, that's generally detergent/dispersant commonly used in EO additives. i'm wondering if it's due to the use of RCL, Octane boosters (used amsoil dominators and torco's accelerator) or it comes as a natural additive in our Petronas Primax fuel. Hell, it could even be the Techron additive i used previously although http://www.bobistheoilguy.com/forums/ubbth...tΝmber=273248 & http://www.techron.com/what-is-techron/proven-science.aspx doesn't seem to indicate so. Some additives do not show up in our tests. For example, we don't test for tungsten as part of our normal test, so we might not see that additive in our sample. We don't normally see any real benefit to running additives, but we don't really see any problems from it either, at least not in our tests. I'm not sure what the additive companies use as their base stock because we're not able to test the base stock in our lab. Our general theory on additives is that the oil already has additives present, so there's not really any benefit to adding more stuff when the oil is already formulated very carefully. But then again, we haven't seen any evidence that they hurt anything, so if you like them, then by all means, keep using them! Maybe once you see your oil analysis results, you'll start to experiment by using additives sometimes and not other times, just to see how the engine does with and without them. From my understanding ceratec uses ceramic particles and ws2 is basically tungsten disulfide, so are we able to find out the contents through this oil analysis? and whether these additives are useful (or even harmful) to my engine? Moreover I've been told (do correct me if I'm wrong) that most additives are using cheap mineral oil as additive carrier and that could cause sludge and other harmful issues despite using good/reputable synthetic engine oil as a majority. I usually don't use any additives and unless there is a specific needs for them or a technical reason behind them. For now the only thing I plan on using is concentrated spray intake cleaner for my BMW and only because it is a GDI engine. I agree with BSL's assessment that the EO is already formulated for to meet its product target. As for the Evo X I've bought some intake cleaner for it as the EGR and PCV system would have slightly dirtied the turbocharger and intake manifolds after 70000km so I thought why the hell not. 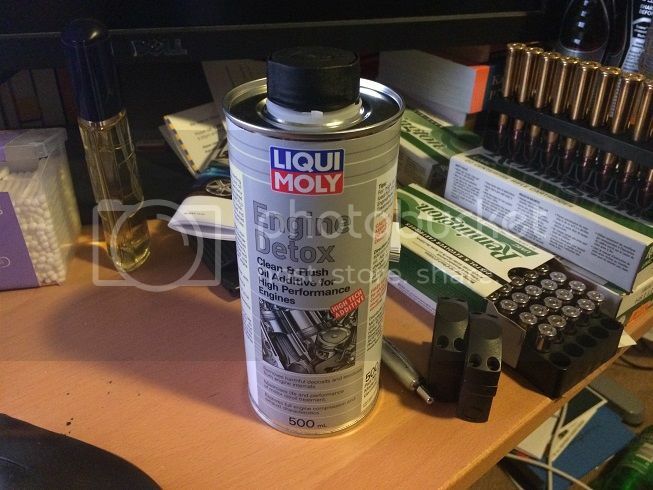 Also got a can of LiquiMoly Detox, the industrial strength and more potent version of the standard 300ml LiquiMoly Engine Flush. Probably just mineral turps but it's concentrated and comes in a huge 500ml bottle, so I figured "why not?" although, since your bmw is fairly new, i suppose you wont be using it any time soon? btw that table yours? interesting looking shells - hunting or shooting range? Don't think I'll be using it on the BMW soon. Just the Evo X and maybe the R34 once I undo the damaged those car thieves did to it before the police recovered it. Going to change the tyres as well on the X to Goodyear Eagle F1 Directionals. No need anything really sticky, the car has been relegated to supermarket duties. Yeah the table is mine. Loading my magazines as I have a shooting competition on Sunday. eh you've mentioned the recovery of the R34 very long time ago (over a year already or not?) still working on the repairs? Yeah. Still working on the repairs because the car is quite low on my priority list and is now sitting in storage. I am worried about the wear and what oils I should use. I might just buy an engine crane and rebuild it by hand. Engine building is surprisingly simple when I leaned it working at my previous job. Fastest supermarket car ever! Danish made Intrax Suspension with SuperPro bushes, DBA 5k rotors, Full Race manifold, Tomei exhaust, Cosworth IC and Intake kit and larger MHI Turbo. Is it advisable switch from 0w-40 > 5w-50? All the while been using 10w40, 0w40 since I'd got my car. Engine feedback respond is quite positive since my car engine is 4G93..as you know this engine valve lifter prone to noisy & loud due to different EO grade used. so you got too much performance/good FC and want to lower that by going for thicker EO? why you want to change to xw-50 oil? is it because want extra protection? or.. you expect that it will give quieter noise? or.. the foreman keep asking you to take xw-50?